80 pages | 1 B/W Illus. From the mid-1970s until the crisis in 2007, the world of finance enjoyed thirty euphoric years as the general public, businesses and governments put their blind trust in financial techniques, professions and institutions. Shaken up by a structural crisis and a crisis of legitimacy, today’s financial sector can no longer afford to avoid the issues summed up by the key question: what is next for the role of ethics and responsibility in finance? Many see an unbridgeable gap between ethics and responsibility and financial practice. Ethics and Responsibility in Finance paves the way for the dialogue that is needed in order to solve the current problems and allow the return of a refined ethical thinking in the financial sector. This book opens with an in-depth analysis of the operational implications of two key notions: ethics and responsibility. It then addresses ethical dilemmas that are characteristic to each of the three actors involved in any financial transaction. This begins with the discussion of the dilemmas of the ultimate owner of funds: the individual or collective saver, as in the case of pension funds. The analysis then turns to financial intermediaries such as banks, insurance companies, asset managers, and consultants, who work in a web of different loyalties. Finally, the dilemmas of the user of funds are addressed – the household taking a mortgage, an enterprise or a public authority which borrows – all of which have to be clear on the reasons and values driving their decisions. 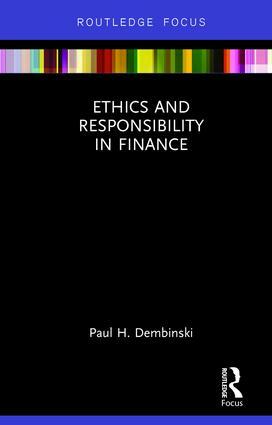 This volume is of great interest to those who study banking, corporate finance and ethics philosophy. 1 Introduction: why does finance need ethics? 2.1 Can finance be defined? 2.5 How to define ethics? 5.2 Advise, prescribe or sell? 5.3 Financial innovation: cui bono? Paul H. Dembinski holds the Chair of International Strategy and Competition at Switzerland’s University of Fribourg. He has a doctorate in political economy (1982) from the University of Geneva, where he began his teaching career, later (1991) becoming a tenured associate professor at the University of Fribourg. In 1996 he launched the Observatoire de la Finance Foundation in Geneva (www.obsfin.ch) with the aim of encouraging the financial sector to take more account of the common good. He is still its director, and is chair of the international ‘Ethics & Trust in Finance Prize’, which will be awarded for the sixth time in 2017. He also edits the bilingual journal Finance & the Common Good/Finance & Bien Commun. Paul H. Dembinski is on the board of directors of Rentes Genevoises (public annuity company), which he has chaired since 2012. The fields of economics and finance are constantly expanding and evolving. This growth presents a significant challenge to readers trying to keep up with the latest important insights. Routledge Focus on Economics and Finance presents short books on the latest big topics, leveraging cutting edge research from scholars globally. Individually, each title in the series provides coverage of a key topic, whilst collectively, the series forms a comprehensive collection across the whole spectrum of economics and finance.